The Mailloux Moment: FWF: Here fishy, fishy, fishy! This is the only way I seem to be able to catch any kind of sea-life. It's a good thing I don't have to depend on my fishing skills! My favorite part about this are the bubbles. I put Glossy Accents on them so they would pop out a little. 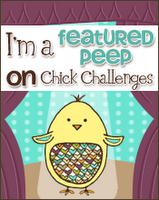 So, I tried to give away some blog candy last week and only had one bite. Which now that I think about it, is a thousand percent better than my fishing average last summer. Anyway, if you'd like a surprise in the mail, send me an email (sarahandalan at msn dot com). I have a few packages all ready to go! Have a great weekend! I ned a trip to the ocean to dip my toes in. Thanks for the little trip for my mind! This is so adorable.... I read, so I will email! Hi Sarah, your card is so gorgeous! Love the waves, the gorgeous stamped images, it's a beautiful scene! Have a fabulous weekend! 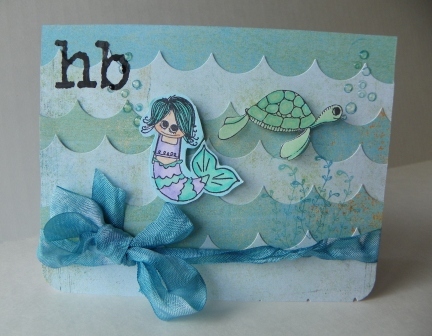 Your card is so cute, love that little mermaid and the whole ocean scene. Very cute card! Love the bubbles. Great blue ribbon & fun layered waves! AHH! THIS is a completely precious card! Fun card. Love the turtle.